This is Ben Poremba’s first foray outside the Botanical Heights neighborhood, where his other restaurants are located. Located on the first floor of Clayton on the Park in Clayton, Parigi will offer breakfast, lunch, dinner, catering, plus room service to residents of the building, as its prior restaurants (Smith & Slay’s, Finale) had done in the past. Parigi, the Italian word for Paris, telegraphs the culinary theme of “contemporary Italian food using classic French techniques.” And considering the building is home to a number of pro athletes and their families, Poremba goes a little further, offering big-portion, bone-in steaks and family-style side dishes. The Isreali-born chef’s restaurant interiors Elaia, Olio, Old Standard are progressive and energetic. Parigi follows suit. 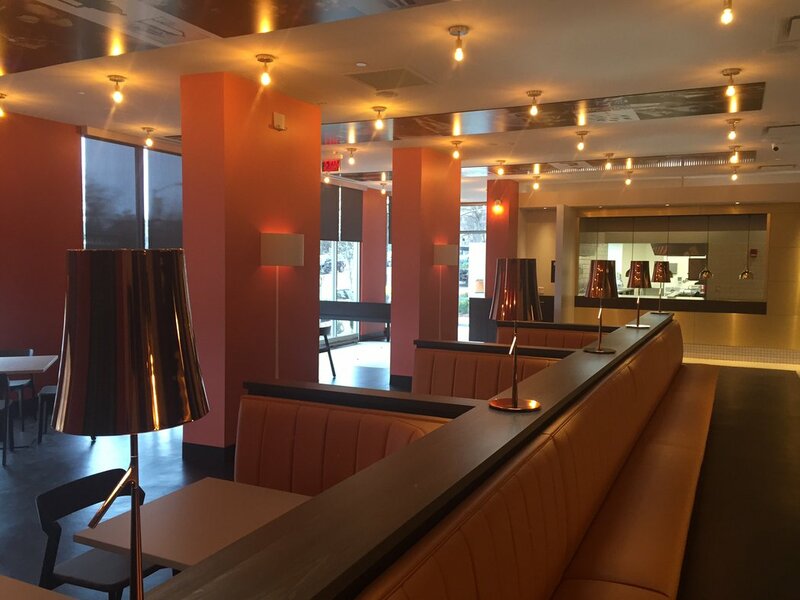 One might question the juxtaposition of carmine pink columns and Valencia orange leather booths, but the bold and assertive combination (above) is both handsome and effective. At press time, a crackerjack management team is on board planning for the grand opening. Parigi is a restaurant to watch for 2016. It will be the first envelope-pushing Clayton restaurant since The Libertine . 8025 Bonhomme.